Synopsis: A documentary focusing around Area 51 and the cover-ups the government put in place to protect secret military operations. Area 51 has always been a source of debate and controversy. Is the government housing aliens and/or alien spacecrafts and technology? Or is it just a highly classified area designated for designing and experimenting on new military weapons? Based on the book of the same name, MIRAGE MEN documents the government's involvement in alien activity and theorizes, and somewhat proves, that the government created and fueled alien stories to the public to cover up clandestine military operations out of Area 51. Though there are many stories/conspiracies the film tackles, the centerpiece is a former counterintelligence officer, Richard Doty. Doty is a man trained to lie. His job is to make you trust him and then feed you misinformation. Even though we are told this about Doty at the beginning, you easily forget that fact while he's talking. He's strangely charming and feels at ease telling his stories. It's easy to get drawn into him, and then you're jolted back to reality when another fact pops up, and we're reminded that Doty lies for a living. It's strange to leave a documentary not fully knowing whether to even believe the main character or not. Doty ends up being one of the most enticing people I've ever seen on film. In the end, he eventually states his reasons for telling the directors all of these government stories, but there's still an uneasy feeling in the air of whether anything he even said was truthful. During the Cold War paranoia in the 70's and 80's, the United States was testing out new and advanced weaponry, like the Stealth Bomber. When local man, Paul Bennewitz, began seeing strange lights in the night around the area, the NSA and Doty started feeding him false information, planting "alien" artifacts for him to find, and even messing with his T.V. by beaming fake alien messages. The result was Bennewitz becoming a man who lost his sensibility and became one of those crazed lunatics we all scoff and roll our eyes at. He becomes the scapegoat, and the government secrets are protected. The film is chalk full of stories similar to Bennewitz's that the story is so dense and feels almost overwhelming towards the end. 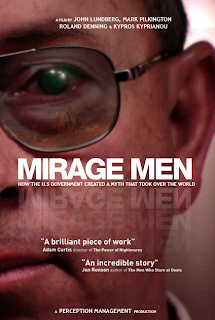 Towards the last act, MIRAGE MEN suffers from feeling too repetitive. The talking heads end up repeating the same ideas over and over. With another good editing, this film would feel more solid. With Doty's stories and government lies, it all makes think about the theme of trust. It's an unsettling feeling not feeling like you can trust the entity that is there to protect the people. And the questions and uneasiness the film creates is what ends up being most unsettling. This film did something I've almost have never seen before...it raised questions about the initial questions. How much has the government fabricated about aliens? It's tough to fully believe everything presented because of the nature of many of the sources. Though it's not a perfect documentary and suffers from repetitiveness, it's worth viewing and discussing because it definitely will open your eyes to possibilities or "truths" that may have never crossed your mind.